If you cropped that photo for the shadow I would totally believe it was a Were-Rabbit. Totally. Fats casts an awesome shadow. 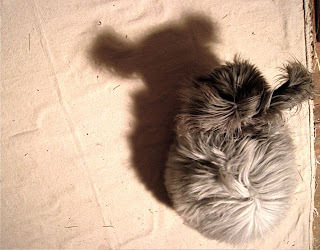 Rabbit and the shadow... nice photo! All these lovely pictures of angoras make me want one so badly! Do you spend a lot of time grooming them? Ooh, I think Fats would love a hammie! Not a crazy idea at all :D I remember watching a video of Fats and a hamster... there is such a video, right?? I've been having long work days and sometimes I think I'm losing my mind, lol! I really like this photo! I agree, interesting shadow! My friend used to have a hamster living in her room.. no cage. But it's hard to find such a small fella in a room with lots of hidey-holes, and they don't exactly come to you when called, so I'm not sure if it's a good idea to allow a hamster free range of the place? Some breeds of hamsters, e.g. Syrian, Chinese Dwarf etc. are solitary and cannot be housed with another hamster. They'd tear each other apart. I'm not sure how they'd take to another species, although I've seen many photos of rabbits and hamsters together. It's the sweetest thing in the world, looking at different species getting along so well with each other! Love the shadow pic - must experiment with my two and their shadows...I only hope they stand still long enough for me to take a shot! I want a bunny, but can't have one (two crazy mutts live at our house). So I will be checking in often to get my bunny fix!